Our product range includes a wide range of printed beach pareo, beach pareo and printed pareo with fringes. We offer high and fine quality Cotton Printed Pareos, which are made by using skin friendly raw material. 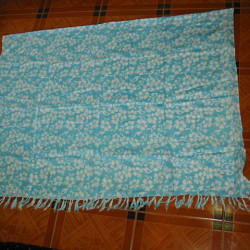 We offer high and fine quality Beach Pareo, which are made by using skin friendly raw material. We offer a wide collection of Pareo that is designed and developed keeping in mind the latest market trend. We provide this range to our clients in various attractive colors, color blends and alluring patterns which suit to the clients’ desired requirements. You find unmatched quality in our offered range with comparison to others. Further, our range is known for its durability, colorfastness, smooth texture, clean finish and fine stitching.